I cant believe 2019 is a little over 2 weeks old. It’s that time of year when my fellow wedding photographers and I have a slow season where we try to set goals , pay taxes (yuck), and use continuing education to learn how to be better photographers for our 2019 and beyond couples. I have set goals, and I can proudly say I have done a great job at keeping them in the last two weeks. I have paid my taxes ,and well let’s just say I am on the college Ramen noodle meal plan for a month. This year I am traveling to Charlotte, North Carolina and Atlanta, Georgia for two in person workshops, but I am also taking a few online workshops and classes. I was one of those kids who loved school and learning, and I still do. I love learning new things, discovering new ways to do things better, and growing as a person. I have been recently researching the top trends of 2019, and I thought I would share my findings. Though blush and champagne are classic wedding colors brides are moving from warm color palettes of rose gold and soft pinks to cool palettes of silvers and blues. Rich blues, hunter green, burgundy, and slate are becoming the new staple colors in the wedding world. When my friends were getting married seat covers were all the rage. Then it moved it into gold backed chairs with cushions (you know the ones). But now with the growing for desire for community, furniture that would normally found in the home are now being found at weddings as well. We live in the days of social media, which has brought the desire for close knit community to a head. Today’s brides and grooms are looking for their day to be about experiencing their day with those that they do life with on a day to day basis. You see this in the growing popularity of communal head tables verse sweet heart tables. First looks or longer cocktail hours are more frequent so couple have the ability to spend quality time with their guests. 2019 couples are spending more high quality food than other aspects of the wedding day. Large portions of the budget that used to go to floral and dresses are now going to food and beverages to be enjoyed with beloved guests. Quality dining experiences around the table are becoming more valued than centerpieces in the middle of the table. I am a 90’s kid through and through, and the trend I am most excited about it this one. I say the my office is a 90’s music zone. Since most of the generation that grew up in the 90s are marrying later we are seeing our nostalgia come to play in weddings. Bright color accents to 90’s cover bands are giving my favorite decade a comeback. Individuality is taking over the wedding world. Personal touches are what couples are using to make their wedding about them and not just throwing a fancy party. Brides are getting custom dresses more and more instead of getting a dress they saw in a magazine. Yes. Pinterest is still a very strong force in wedding planning, but now couples are using their story as inspiration more than their Pinterest board. Small backyard weddings are becoming more and more popular. Instead of having lavish weddings are choosing to keep the day simple. We can thank Megan Markle for this trend, Yes, she married a prince in front of the world but her simple elegance has inspired brides all over the world. Her simple makeup and clean white dresses have definitely played a part in the simple elegance we are seeing in the industry. Destination weddings are becoming more and more popular. Whether domestically or internationally couples are taking their loved ones to experience another place with them. From Nashville to Paris weddings are becoming a weekend event instead of just a one day event. I love to travel so this trend is right up my alley. I think Instagram is to thank for this. Having installations are a beautiful backdrop for photography. 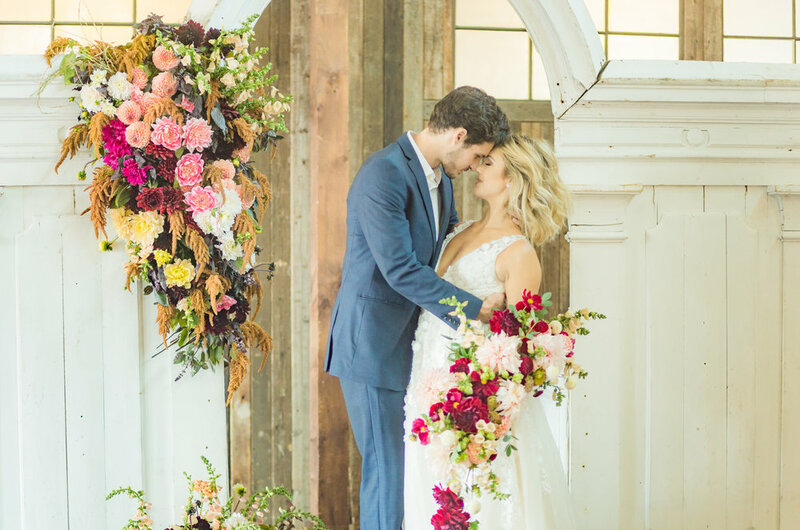 These jaw dropping displays bring the wedding floral attention and focus. They show of the talent of their vendor, and tell their guests how important flowers are to them in a grand way. 2019 couples are planning their weddings in 6-8 months instead of the year long process of old. If they have a popular date that is meaningful they are still booking vendors far out but most are shortening engagement times and just getting to the marriage. We live in the age of instant gratification so I can see why this is a growing trend.